Vijverstraat house in Veldhoven, just after Diane and Lina purchased it. 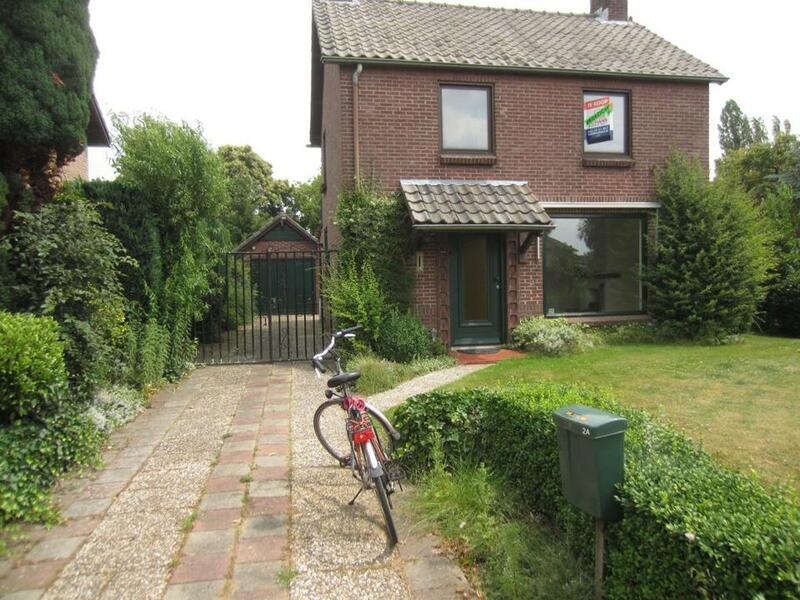 ‘Huizen te koop.” “Vrijstaande woning.” I couldn’t pronounce them, but my Dutch wife taught me the words for “houses for sale” and “freestanding property,” so I could research listings at www.funda.nl, the real estate website we studied furiously last spring. Under the terms of our “10-year plan,” concluding in 2014, it was my turn to become the expat and Lina’s to be home, where she would be closer to family and bicycle everywhere on designated paths. 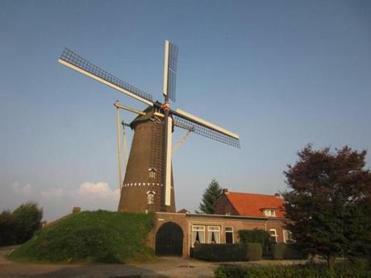 The local molen, or windmill. Now in our 50s, Lina and I had met in Boston in 2003. She’d arrived the year before to work with a medical diagnostics company in Rockland, and I was living in Quincy. After we’d dated for half a year, her company shuttered the site and transferred her to its office in Durham, N.C. We moved south together and for $185,000 bought a historic 2,000-square-foot house on a double lot in a slowly gentrifying neighborhood. We loved our life there, but as Lina’s parents aged (mine are deceased), the countdown carried greater weight. After a year of searching, Lina started a job in her field last March in the medium-sized city of Eindhoven, about 75 miles, I mean 120 kilometers, southeast of Amsterdam. Instead of renting first, we decided to jump into the real estate market. Like most of the European Union, the Netherlands was just coming out of an economic slump, and housing prices were still “low,” which I was dismayed to discover still meant twice as much as in North Carolina and more in line with metro Boston. My role was to ready the Durham home for the market (thankfully a booming one), while Lina’s was to research properties we found online in preparation for my spring visit. We soon realized my suggestions were ludicrous within our budget of 350,000 euros, at the time about $485,000 — more than I ever thought I would spend on a house, especially a small one. The Netherlands is one of the most densely populated countries in Europe, meaning space is tight. I welcomed the forced downsizing, but I dreaded the typical Dutch home’s lack of closets, and staircases more appropriate in lighthouses. 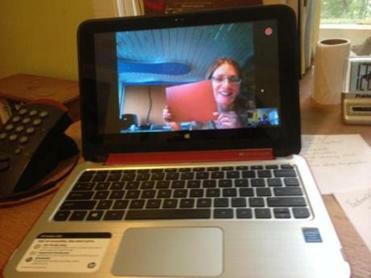 After a few online searches and interviews, I chose a “makelaar,” or real estate agent, who was cheery, spoke English, and was willing to Skype. Visions of being escorted around like I’d seen the one time I watched HGTV’s “House Hunters International” vanished when she informed us it was our duty to narrow down the search, make our own appointments with the seller’s realtor, and call on her only when we wanted to follow up on any houses. Lina at Piet's showroom holding up choices of countertops via Skype. Every evening, Lina drove by houses that held promise online, narrowing down our list before my whirlwind visit last April. 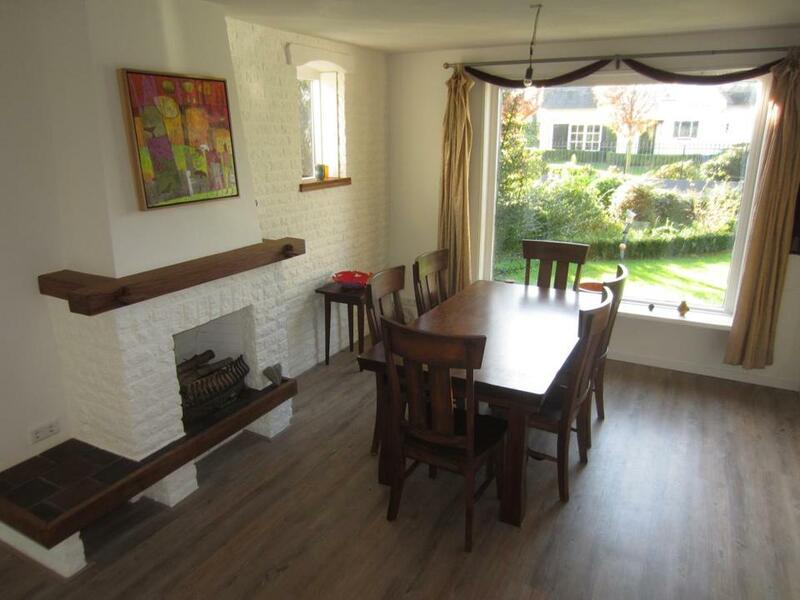 After several days of touring urban and rural homes, most of them desperately in need of major upgrades, we deemed only one “gezellig.” The Dutch expression means anything that feels cozy and inviting, which could include a family gathering, coffee date, or a dwelling. The 1957 red brick house with forest green trim on Vijverstraat in the small city of Veldhoven, bordering Eindhoven, gave us that vibe. The setting enticed us first. Veldhoven was formed by joining four “kerkdorpen,” or villages centered on a church. “Our” house was in the center of Zeelst, one of the historic villages. From certain points, we had a view of the local church’s steeple and could hear the bells toll. Bars and restaurants lined the center, which was more townie than trendy (flashes of Quincy). Inside, the living/dining area featured a funky raised white-brick fireplace with a walnut mantel. Typically Dutch picture windows covered the front and back walls, in this case lined up so evenly that from the street you could see through the house to the tiny but lovely back yard. (Many people don’t cover their windows until nighttime, and not always then.) Other pluses: a detached one-car garage and the all-important bicycle shed; Lina’s job would be only a 15-minute ride away. At 1,100 square feet, the house was small but doable, despite its steep, narrow staircase. Only one of the three bedrooms upstairs allowed space (barely) for our queen-size bed — without its frame. The larger downstairs bedroom, added in the ’90s, would double as my office and the all-important guest room. The biggest minuses were the bathrooms and the kitchen — they were horribly outdated and in bad shape. 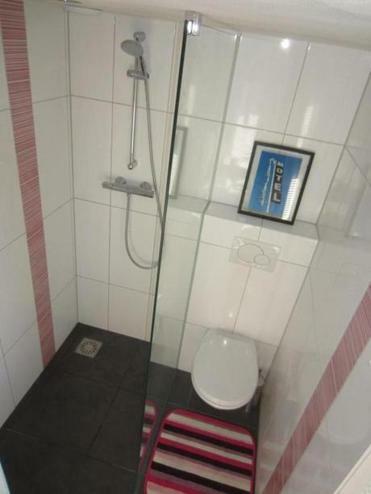 Even worse, the itsy-bitsy upstairs bath had a toilet in the shower stall. Still, the negatives didn’t tarnish the gezellig-ness. 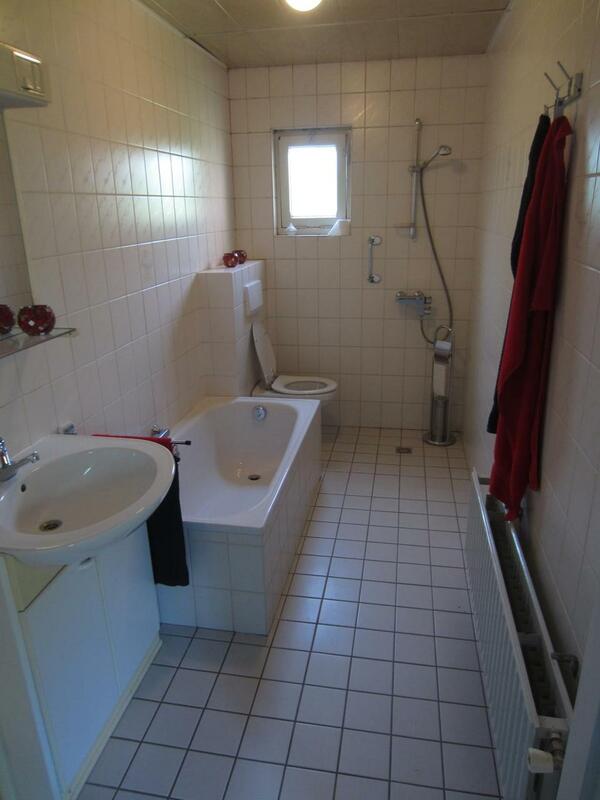 We bargained the price down 20,000 euros to 265,000, or about $365,000, knowing we’d shoot the rest of our budget on renovations. While I worked in Durham to get our house in shape to sell, Lina spent many hours with Jurgen, our contractor, and Piet, a custom-kitchen builder who, thankfully, persuaded us to knock down the wall dividing the kitchen and living/dining area. Lina and I had no experience in redoing anything and zero interest in talking about decorating. Suddenly, we were discussing tiles, faucets, and floor plans. 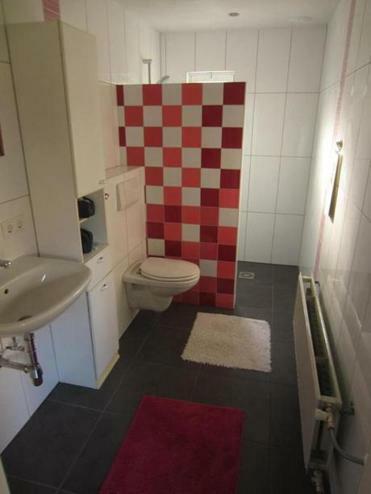 With Jurgen’s input on black bathroom floors and white walls, we added red-, pink-, and white-striped accent tiles. Lina and I designed a tile shower partition that I prayed I’d like in person as much as I did in the drawings. 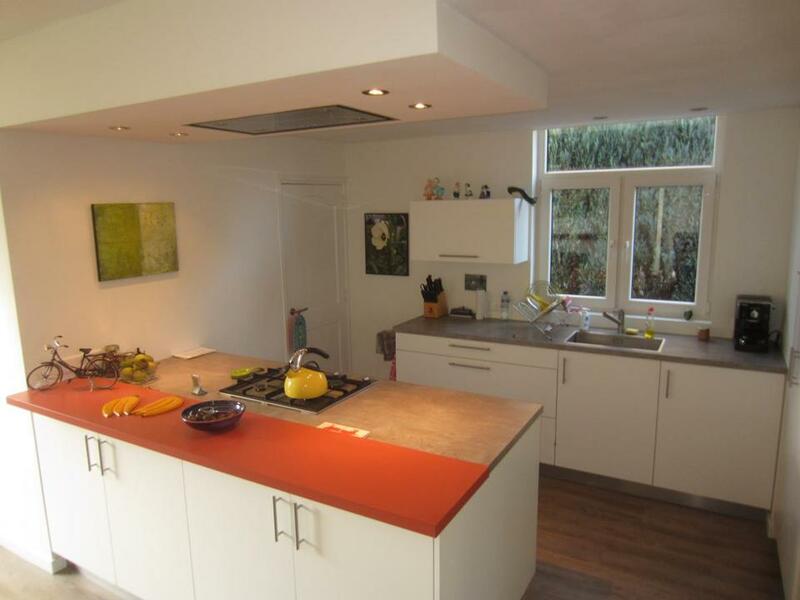 Piet and his workers created the kitchen with input from us on the countertops, fixtures, and appliances. Lina would go to their showroom and Skype me while holding up samples, with an amused Piet jumping into the conversation when needed. As expected, he recommended we choose a compact combination microwave/oven, common in Europe, and a freezer-less fridge half the size of my medium one at home. “It’s the standard size here,” interjected Lina, who had been away for a dozen years, so what did she know? 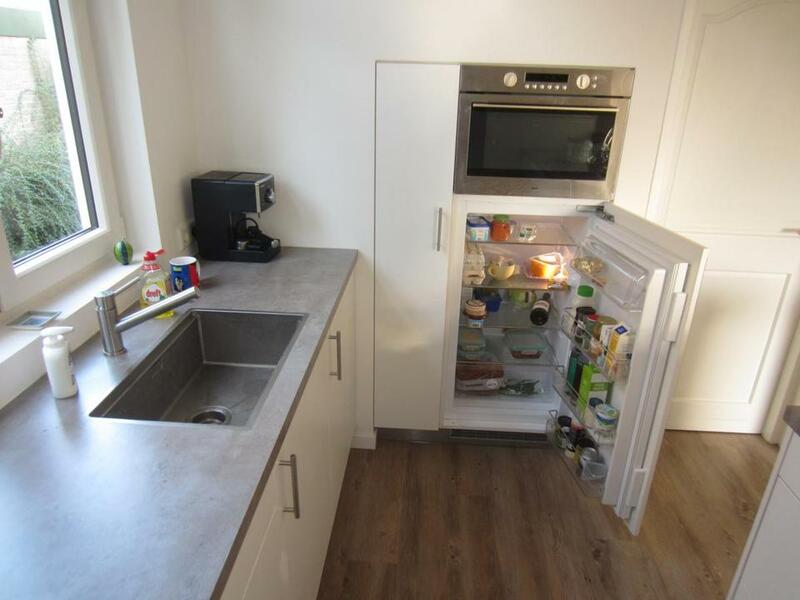 The Dutch refrigerator, without a freezer, and topped with a microwave/oven combination unit. “Is this what most people get, even now, Piet? Do you promise?” He nodded. Jurgen’s wall-bashing crew arrived first, as he raced the clock to finish before the “bouwvakvakantie,” the three-week August vacation most construction workers take. He also destroyed the floor in order to install radiant heat, Lina’s strategy to keep me warm (and, hence, happy) in a country where gray skies and precipitation are business as usual (think Pacific Northwest). The Durham house sold, so on a Friday in late September I flew overnight to Amsterdam with Q-Kitty, our 10-year-old scrawny black cat. The three of us had a teary reunion outside customs and then headed home. My first thought walking in the front door was, “Whoa, this place is even smaller than I remembered.” But then the kitchen won me over, with its gleaming appliances and the happy orange bar top that Piet had feared was “too bold.” I rounded the corner to the bathroom with the dancing colors and cried. It was a work of art, and Lina and I had created it together despite being 4,000 miles apart. 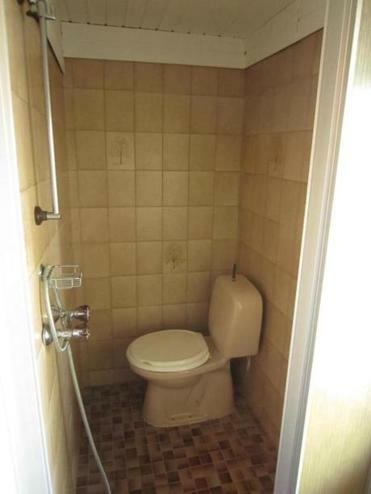 Upstairs, she had cleverly redesigned the bathroom, slightly enlarging it and removing the toilet from the shower, though the “seating space” was still so tight that a linebacker would surely get stuck. Speaking of toilets, Q-Kitty approved of her litter box placement, in the laundry area next to a washing machine with 15 indecipherable settings, all of which initiate a two-hour-plus cycle. Our shipment of household goods and carefully measured furniture arrived a couple of weeks later, slowly transforming our house into our home. My favorite spot has become the dining area, where I can sit at the table and watch cyclists pass 30 feet from the front window — a quintessentially Dutch sight. During my first few weeks here, on walks with Lina to the local windmill, I scrutinized other kitchens, easily visible through the uncovered windows. To Lina’s relief, I finally gave up, or rather gave in. Who needs ice cubes and 20 choices of condiments? And there’s always 2024, when it’s my turn again. I’m thinking Florida. The view from the front window, with North Carolina art on the walls.